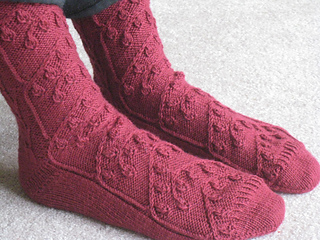 The front of these socks has a motif of bells hanging from drooping snowdrop stems – or perhaps bellflowers or bluebells or various other fritillaries. The back of the sock is worked in a version of a tulip cable. All is worked over a reverse stockinette background. 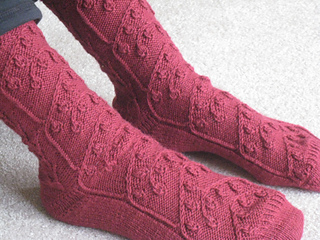 The flower stems on the front of the sock are achieved though 2- and 3- stitch cabling. The flowers themselves are the product of double increases and decreases. 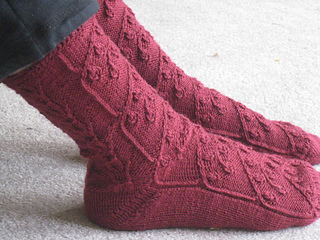 It has a short garter stitch cuff, a rounded toe, and a yo-yo heel (a type of short-row heel). The yo-yo heel is the only short-row heel I’ve found that will easily fit any height arch. The pattern is charted with different charts for small (7”), medium (8”), and large (9”).